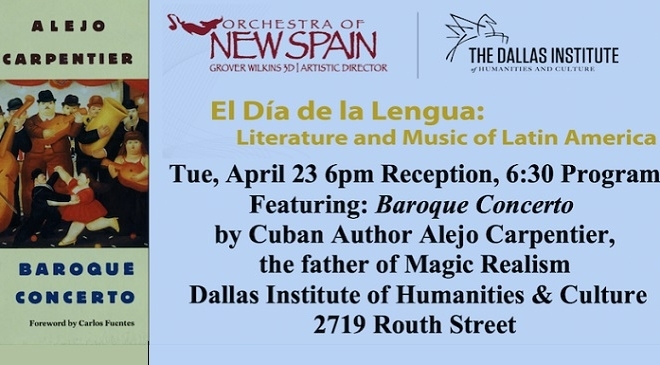 The Orchestra of New Spain (ONS) and The Dallas Institute of Humanities and Culture present El Día de la Lengua: Literature and Music of Latin America April 23rd at The Dallas Institute, 2719 Routh Street, at 6pm (reception) 6:30-8pm program. April 23, 1616 is a notable date in English and Spanish literature for the death of the authors of Macbeth and Don Quixote. In the Spanish- speaking world the day is recognized as “El Día de la Lengua Española”– the UN-proclaimed Day of the Spanish Language. To mark this date, the Orchestra of New Spain and The Dallas Institute have curated an evening that focuses on the work of Cuban author Alejo Carpentier, one of the first to use the fiction style of ‘*magic realism*’ to enliven Latin American history with whimsical fantasy. The evening begins with a reception featuring wine and Latin food, followed by the program, which presents readings from three of Carpentier’s books, layered with the musical selections that they inspire. The narrator is noted baritone Theodor Carlson. He will be joined onstage by ONS soloists, presenting works from the Orchestra’s vast repertory of Hispanic music, in this case reflecting an aspect of each novel.